Many people don’t think too much about ants until they invade their homes or offices. 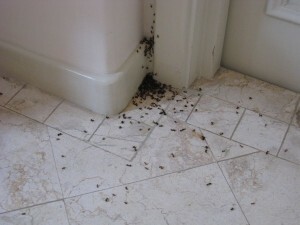 Ant elimination can seem like a never-ending battle, which is won by the ants all too often. If you’ve fallen victim to an ant attack in or around your home, don’t hesitate to reach out to the Eco Tech, your local Minneapolis MN exterminators. Some ants can support up to 100x their weight. The largest ant colony ever recorded was over 3700 miles wide. Ants are thought to be the longest living of all insects, with some living up to 30 years. Ant species like Carpenter ants can cause damage to homes due to their affinity for building nests in wood. While these facts are quite amazing, they show the resilience of ants. Eradicating ants in your home is not easy. Sure, you could pick up some consumer grade ant spray at your local hardware store, but chances are this will not completely get rid of an entire ant colony. Ant colonies can consist of many thousands of ants ready to replace the small number that are killed by consumer grade extermination methods. At Eco Tech we’ve worked for over 15 years, helping our customers get rid of ants in and around their homes. Our experience serves us extremely well when trying to rid an area of pests as resilient as ants. Our pest control professionals start by locating the ant colony and identifying the type of ant that has invaded your home or office. Once we’ve identified the species of ant we can then come up with an ant elimination method that is geared towards the type of ants that are in your home. We use highly selective pest control methods that are much more environmentally friendly than many of our competitors. Our less toxic, organic pest control product line is extremely effective at getting rid of ants, but not causing problems for you, your family or even your pets. As the weather warms up it’s time to get rid of the ant problem that has been plaguing you for far too long. The warmer it gets outside the more problems you’ll have with a growing ant colony around your home. To get rid of your ant problem once and for all, contact the pest control professionals at Eco Tech today at 763-785-1414 to setup a free consultation.